A splash guard holder is an integral part when operating a mist maker or misting fountain. This one comes with many fountain models, but it is also useful by itself as a replacement part or a part to construct something of your own. It is the verticle support that will hold up the splash guard over the misting unit. With these parts together, you will be able to block any of the heavier splashing while allowing the natural mist to flow freely. This will keep the area around your fountain dry and mess free. When purchasing a part like this, you want to make sure that you are getting the right size. Some misters will be too big to fit in the middle of the circle, so this part will be incompatible. Of the mist makers that we sell, this holder works with the CH-24 and JAS-20. If your mister is larger than these, you will need Splash Guard Holder B. If you have one the same size or smaller, then you may be able to use Splash Guard Holder A. Just be sure to check the inside diameter against the overall dimensions on your mister. Due to the open nature of this holder, it will alow for maximum mist flow, and also make it easy to direct the cord exactly where you want it. 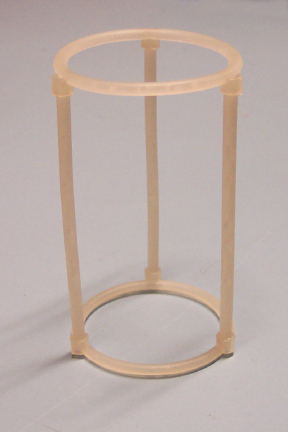 This part may be used to make your own fountain, or to replace a broken one from an existing model you have now. It is also integral to any sort of custom humidifier or other project because as the misters generate fog, there will always be a bit of splashing that needs to be contained. These plastic risers are designed to last for years, but due to accidents, loss, or heavy use, you may need to get a new one. Splash Guard Holder C - Repair a broken fountain or make your own with this replacement part. Use it to support any glass dome and house your misting device. great item. it works well. Just what I needed. Will likely order a couple more! I am so appreciative of the wonderful customer service from SimplyGoodStuff.com . Everything I have recently purchased here has been fine. There was a problems at first, but they were in contact with me and resolved the issue immediately. Hard to find good customer service anymore. This company is great. All my purchases met my expectations and are of good quality. Thank you so much SimplyGoodStuff!